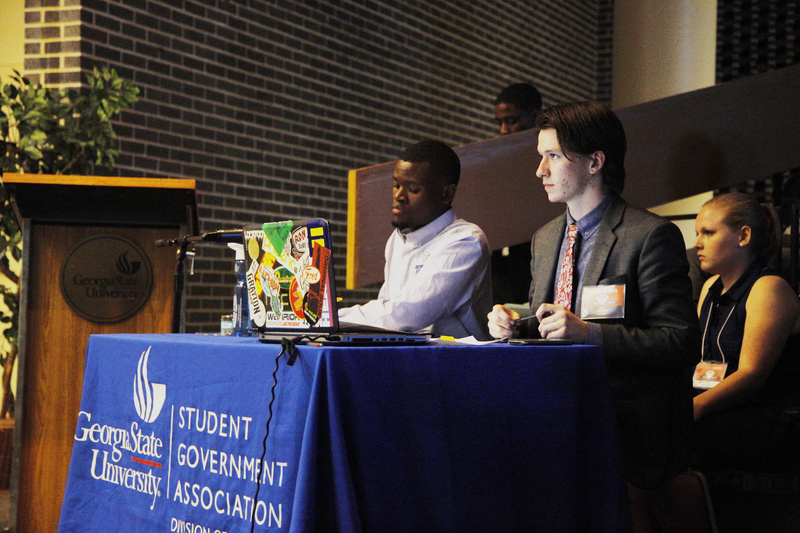 On the evening of March 29, The Signal held its first round of Student Government Association (SGA) candidate debates. The four presidential hopefuls took the stage first. Candidates Fortune Onwuzuruike, Adib Chowdury, Eugene Butler and Sri Rajasekaran fielded questions of campus safety, the GSU-GPC consolidation, SGA happenings and leadership experience. The presidential candidates were first asked if, with the consolidation, the next SGA president would need an assistant to keep up with all six campuses. In a mutual agreement, the candidates explained the president should be efficient enough to be able to handle the load solo. When asked how he’ll be everywhere at once, Onwuzuruike said he relied on his experiences among SGA committees to explain his preparedness for the job. Grabbing at a chance to follow-up, Chowdury laid out his plan to start polls provided by the Executive Board for the Georgia State students to express their concerns. As questions rolled on, the candidates laid bare previous accomplishments as well as personal goals, with Rajasekaran revealing one of her priorities would be to address mental health on campus. “It’s an issue very personal to me,” she said. Butler, showing no intentions of making the race an easy one, followed up a question to Onwuzuruike about the establishment of student services that may not have been as beneficial to the student body as Onwuzuruike had originally hoped. And then the questions honed in on campus safety. Onwuzuruike told the audience of his meeting with University President Mark Becker, during which they discussed the security add-ons which have been implemented. “If I’m elected, you would be able to see the police officers, they would be more visible, so the students could feel safer, more comfortable,” he said. And Butler jumped in again, asking what happened to that campus safety-related SGA legislation Onwuzuruike had committed to, and whether he plans on following up. Finally, the candidates debated on their top priorities, and their ability to run the association based on experience, and Rajasekaran was put on the spot, as the leader of the university’s smallest campus. Fortune asked the candidate how she thinks she will be able to handle a transition of leading 2,000 students to leading 50,000. With a fiery comeback, Rajasekaran said her intentions and motivation trump experience, and where she comes from “doesn’t matter,” gaining agreement from Chowdury.